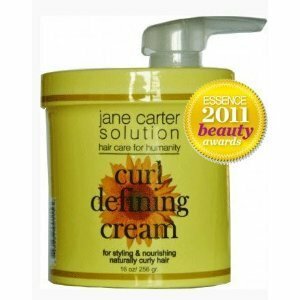 If you have curly hair then Curl Defining Cream was designed for you. Made from the finest natural ingredients, Curl Defining Cream enhances your natural curl, allowing you to enjoy your wash and wear hair naturally. When applied to wet hair, it prevents curls from shrinking as it dries. Curl Defining Cream dries weightless without any build up. Rinsing clean from the hair, you are able to use it several times a week without the need to shampoo. Beautiful curls with loads of shine! We hope you enjoy Curl Defining Cream. Love the hair you wear! Curl Defining Cream was designed to stretch and define your natural curl pattern. Purified water, extracts of anthemis noblis flower (camomile), symphytum officinal leaf (comfrey), equisetum arvense (horsetail), uritca dioica (nettle), rosemarinus officinalis (rosemary) leaf, humulus lupulus (hops), of butyrospermum parkii (shea butter), simmondsia chinensis (jojoba), seed oil, persea gratissima (avocado) oil, natural vitamin E, glycerin, propanediol, poly-quaternium-200, citric acid, polyquaternium-37, ceteareth 20, phen-oxyethanol, caprylyl, glycol, sorbic acid, fragrance. Apply to very wet hair. Finger comb Curl Defining Cream through your hair section by section. As you work it from roots to ends, be sure to allow your hair to remain in its natural curl pattern. Once you have applied it to your hair sit under the dryer for 10-15 minutes. You can also add a little water to your CDC before applying it to reduce your drying time if air drying is desired. The next day you can mist your hair with Revitalizing Leave In Conditioner to rehydrate your hair. In My Opinion Review: 2 out of 5 Stars – for the 4a/b/c textured Natural Hair. I tried the JCS Curl Defining Cream three different times on clean hair that was very wet and each time I got the same results. My hair shrank and felt dry and oily at the same time. It reminded me of 1980’s Jheri Curl I once wore ages ago. The straighter hair did not curl at all and the curly hair curled and shrank to 50% of its length. The Designer Touch and Pink Lotion for ten years were my mainstay products for hair care. My hair grew an inch per month and I saw a marked decrease in the scaly dandruff on my scalp. By the late 80’s I decided to move away from the wet look, my clothes, car and everything and anything that my hair touched was marked by the dampness of my hair products. In addition every touch up cost me 3 hrs in the salon and $60 to $70. My hair style was gorgeous in the Designer Touch curls but going through the process of chemical treating my hair with color one month and then getting the touch up another months was too much hair drama. So, is transition my hair to braids with human hair extensions. So I always thinks for JCS Curl Defining Cream as a good product that is 30 years too late for my hair. In the 1980’s it would much easier to apply the Curl Defining Cream at home to get that curly look than to wait in a hair salon half the afternoon to get a Jheri Curl touchup. In remembering this hair style, the Jheri Curl made long hair look shorter and the wetter the hair the better the style looked. The Curl Defining Cream in a similar fashion takes a while to defined the curl pattern and it requires a daily moisture treatment on the hair. I feel confident that those ladies who are proudly wearing natural curly hair, that JCS Curl Defining Cream is a hair care dream. One quick search of the UTube video reviews for this product will confirm that many women get wonderful results after one application. However, it you hair is anything near like mind, the knot nappy texture mix textures, I doubt if you will enjoy the way it makes your hair look and feel. I purchased my product from Whole Foods at full price because I thought based on the UTube raves that I had found the ‘IT’ product for my hair. Don’t you wish companies would be more specific on who can and who can’t use their products. We need something more specific, like this label: Made for women with super knotty hair, that breaks and tangles easily and shrinks. Anyone who has experienced better results than I did please write back and include your hair type and what you did to achieve the look you wanted. Talk Later !